This week I keep it short. I am going on vacation to the caribbean sea and have a lot of things to prepare. Anyhow I will try to keep up with my coach and do all the workouts. Let’s see if I stay motivated to do Burpees on the white sand beach. I will also try to post something here. The 4th week was kind of hard, after the 15k run on the first day my legs hurt the whole week, but I kept going. I was far away from PBs this week, I remember having that kind of a through in my last 15Weeks challenge as well in the 4th or 5th week. Don’t let this tear you down, keep going, progress will come. Apart from that I found a nice spot to do the workouts not far from my home. It is a playground with a basketball field and there is the possibility to to pull-ups and to go an a run, as it is located in a park. I also found a training group that meets in my town to do the workouts together. After my vacation I will try to join them more often. So, the train to the airport leaves in 5 hours, time to finish packing and doing the last workout at home for the next 3 weeks. This was my third week of the new Freeletics strength coach. You can see the workout plan in the image below. I can not really say what the focus was – partly on upper body, especially on chest with the two venus sessions that include 200 pushups each. But Kentauros and Gaia gave me nice burning thighs, too. It was raining a lot this week, so I did most of the workouts inside. Sadly I cancelled my gym membership last week, so I had to do the workouts at home. This can be a huge pain in the a**, you sweat more, don’t have that much fresh air and maybe your neighbors beneath will not be amused after a workout like Gaia where you are literally jumping all the time. But it’s better than not working out at all. Why did I cancel my gym membership? Because I’ve not been there since I started with freeletics and I have to commit, even some month before that…and in that case 80€ per month are huge waste of money. Also I did not really like going there. It was always crowded and you never could do a workout without waiting for a machine to be free. I was at three different gyms so far and it was always the same: A trainer constructed a workout plan (which was basically the same in every studio) at the beginning and I started to follow the plan. After some time I increased the weights or the repetitions, but anyhow it got boring after a while. So I started to look for more advanced and effective exercises, read books, searched the internet or asked people at the gym (not the trainers because they never had time – or the gym wanted extra money for their time). This was time-consuming and I found a confusing set of opinions about what workout philosophy is the best. In every gym, after a while I was responsible for my workout routine all by myself. No trainier helped me, there where no given targets, except the ones I set myself. And that is the point when I always started to cheat. “I had a hard day today, I will skip and go tomorrow” – “I’ll just do a short workout today” and suddenly I realized – Oops I didn’t go there the whole week. Setting targets and challenging yourself is key for improving in every kind of sport. But especially in the beginning you might try to find a lot of excuses. There will be the point when you stop doing this, when sport becomes an essential part of your everyday life and you do no longer cheat yourself. Just keep going! But why is it so hard to do this? One point is, that creating a diversified, challenging and effective workout routine is complex and takes a lot of knowledge and time – or you spent a lot of money in a personal trainier. With the freeletics coach you get all this for a good price. There is a lot of knowledge behind the creation of the plans and a huge variety of exercises. The aims may be high in the beginning but you will grow and reach them and once you completed you first workouts with a star or beating repeatedly you personal best time you get hungry and always want more! And the best part is, even after the 20week that I do freeletics now, the coach sets challenging targets. I love it! So enough for today, I bought new shoes yesterday and now I have to try them on the 15km run the coach has given me to start week no. 4. Stay focused and no excuses! Success will come as long as you are trying! Freeletics is a form of high intensity training (HIT). HIT is not new, there are different forms of HIT techniques and workouts since the 1970’s. High intensity workouts are basically all based on the following principle. Pullups – do easier versions (like jumping-pullups) or take slight breaks (5-10 seconds) if your muscles are to tired to complete the whole exercise. Level one is when you work with a submaximal number of repetitions. Lets say you could do 10 repetitions but only do 8. Second level is, when you go to your maximum – you do the 10 repetitions. Third level means you go over the point of muscle fatigue – you do the 10 repetitions and try to do one more, it might not be a complete exercise and there will be the point when the movement has to be interrupted. Level 4 is where high intensity training begins. You go until you reach your maximum and then use the following HIT techniques to do even more. To bring your muscles behind the point of failure, there are several techniques that can be used for different kind of exercises and depending on your personal favor. At the beginning it might be hard enough to finish a freeletics workout in acceptable time but later, when you get stronger an more experienced you can use HIT techniques to make even faster progresses. This technique is particularly suitable for bodyweight training like Freeletics. If you reach the point of muscle failure, take a short break (5 to 10 seconds) and then try to do some more repetitions. You can repeat this multiple times. 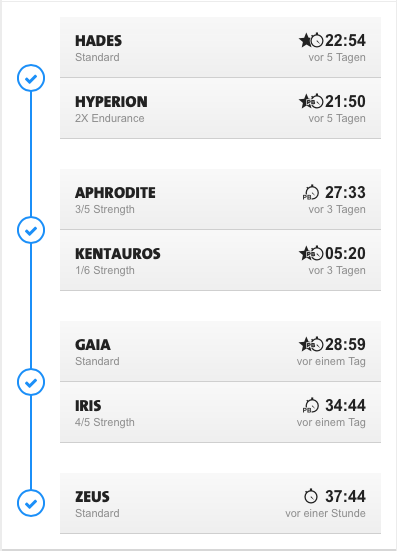 As some of the Freeletics workouts contain exercises with a lot of repetitions (like 100 pushups in Artemis) that you can not do in one go at first, you might even do this without knowing that it is a HIT technique. This is also good for Freeletics and even included in the regular workout routines. When you reach the point of muscle failure, and you can not do an extra repetition, do a slightly modified, easier version. In Freeletics for almost every exercise there is a easier version that you can do, when the actual exercise is to hard. You won’t get a star for your workout, but you will get better at it. An other possibility is to do the additional repetitions with swing (for example when doing pull-ups) but be careful as the risk of injury is increased. Also the strain on the muscles is lower that when doing easier versions of the exercise. This should only be used by experienced athletes. This is a technique that you only should use if you are on an advanced fitness level. You combine two exercises that target the same muscles and do them right one after another without a break. The first exercise (basis) will put the weight on your smaller muscles while the second exercise will stress the bigger muscle. You will find these pattern in some Freeletics workouts and in the coach, but you can also use it to combine your own exercises and workouts if you don’t work with the coach. Most of these techniques are already implemented in the Freeletics workouts and you might be doing them already without knowing it. But I think it is interesting to understand why the workouts are built the way they are and that it is normal and desired that you don’t do the 100 pushups in one rush. This is not a sign of weakness – this is HIT training. Week number two is over…and I have to say – don’t mess with the new coach! On the feedback of the first week I responded that the training program was “way to easy”…so the coach generated a much tougher workout for this week. You can see the result in the image below. At first I thought, yeah this is much better. But after the first day, my whole body hurt. I also had to work a lot and was really tired in the evenings. And I made the mistake to do the workouts on the first training day outside in the rain with inappropriate clothing. I felt like getting sick afterwards. I knew that I had to take a break – so I paused for three days and started from the beginning. With the old coach you had 20 weeks to complete your 15 weeks workout. What I understood from the FAQ of the new coach, this is now longer the case. After 15 weeks your subscription will continue, but you have to pay again…no matter how many weeks you completed. Anyhow, it is important to take your time to regenerate. I always tell myself, that freeletics is still cheaper than a gym – so what. And I also think that it makes no sense to stop after the 15 weeks, maintaining a healthy lifestyle is about integrating sports and good nutrition in your everyday life and not about doing short periods of diet or sports. So after my three days break I returned and this time I managed to complete the week in time (6 days). The focus of this week was clearly on legs. I had to do a lot of jumping-jacks, froggers, different versions of squats and climbers. For details check the workouts of my plan on the left side. When I completed my last 15 weeks coach (cardio & strength) I was able to complete each workout with a star in the end. In the first week of the new coach, this was no problem too. But now I had to go back the the easier version of some exercises (pistols, froggers and Hand-Stand Pushups) as it was simply to hard. But I think this is good – there has to be potential to improve. At the beginning of the 15 weeks it is normal that you can not complete all workouts of even not one workout with a star – don’t worry this will happen soon enough. Set your goals and keep trying. for example if you have to do 100 Burpees – in the beginning when you start you try to make them in a whole, but after 30 or 40 you have no power left. And then all the following will be much harder. For me it worked better to do like 6 x 15 and 1 x 10. 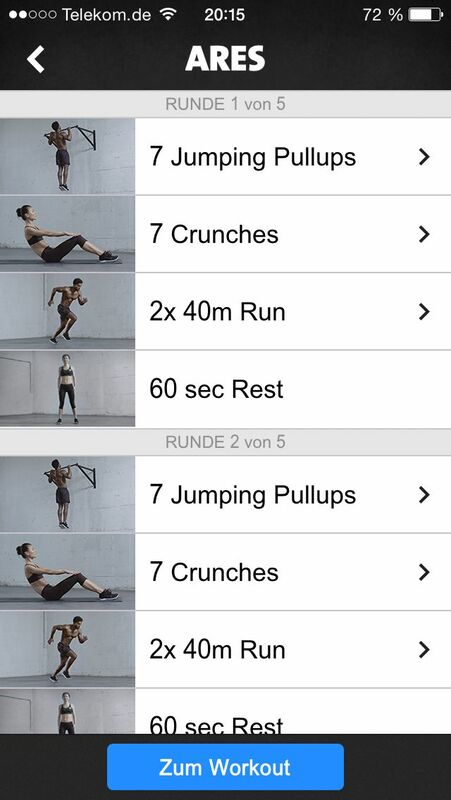 Later you can increase the repetitions to do 5 x 20, then 4 x 25 and so on. At the moment I would do 2 x 35 and 1 x 30. When I started with this strategies my PBs got much better and I started to make quick efforts in increasing the repetitions. It gives you a even better control over your workouts and your progress. So, thats it. Week 2 done! It was hard, but thats how it is supposed to be. 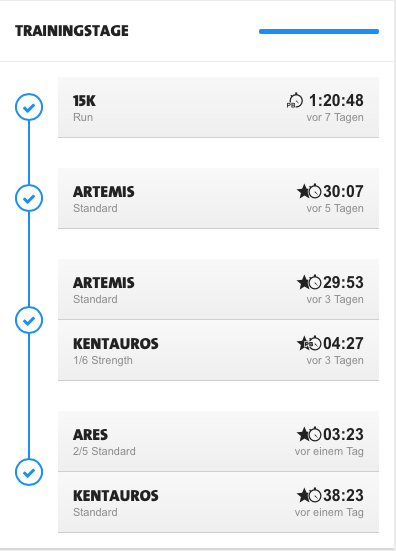 It reminded me of my first weeks of freeletics, when I was not sure if I could complete the 15 weeks, but I did and now I know that I can complete this 15 weeks to and the next, and then the next…and so on. 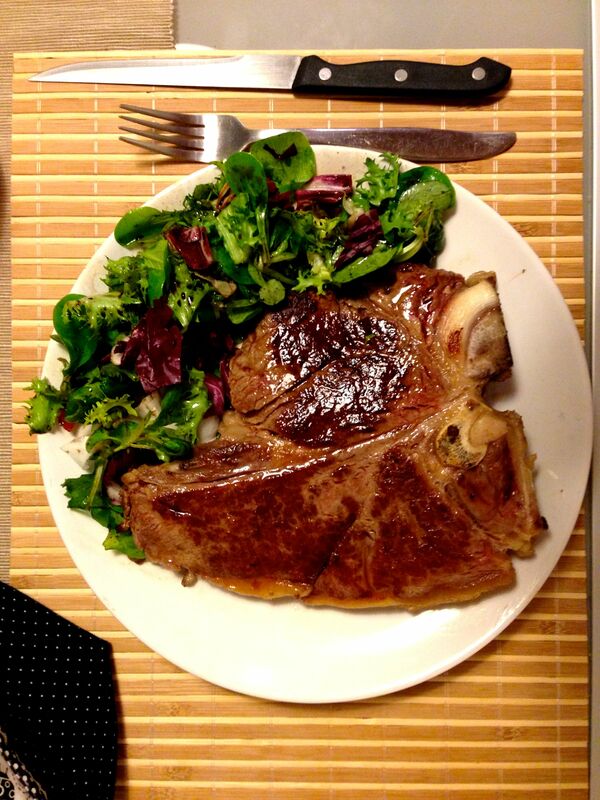 I rewarded myself with a big T-Bone Steak this evening – I needed protein and so I think I will sleep very well this night. Let’s see what next week brings. The first week of my new Freeletics strength coach is over and I want to do a quick review. Compared to my former cardio & strength coach the first week was not that hard, but maybe after a hellweek everything seems to be easy. The coach gave me the following exercises (see image below). It was a little bit to much cardio for my taste, but a little running never killed nobody. I have not been running for a while and the 8km gave me burning legs for two days, in that time I did only upper body exercises and continued with the Hyperion when my legs were ok again. All of the exercises were a little bit different, than I knew them. 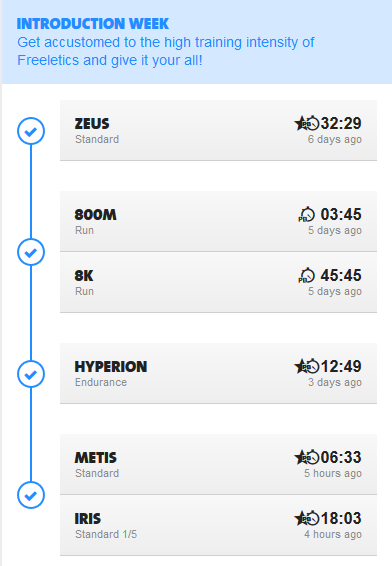 Zeus (Standard) now has 5 more repetitions of each exercise, running is completely new, Hyperion was the Endurance version, not really tough. Only Metis was the same, Iris was only in the 1/5 version what means, that between the two 1km runs there is only one of the former 5 sets of 100 Jumping Jacks and 100 Climbers. The volume of 4 workouts per week was ok, as I said the hellweek last week kind of brought me to a new level, so it seemed to be a little to easy. The new exercises that replaced the max workouts are perfect for filling up those gabs between workouts when they were to easy for you. 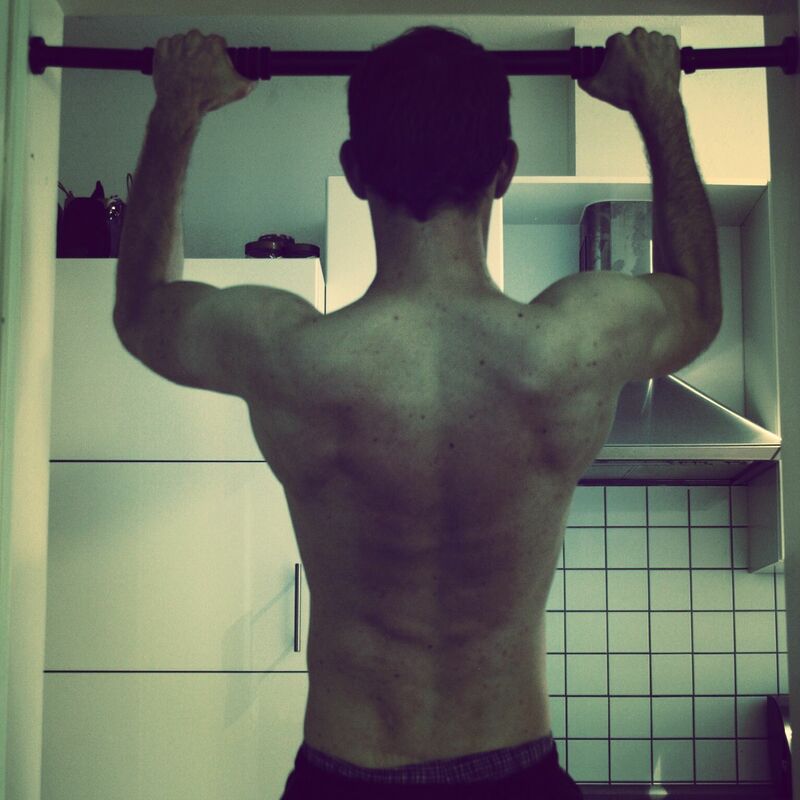 So I did some extra pull-ups, burpees, squats and sit-ups after the regular workouts. After completing the week, the coach gives the opportunity to evaluate the weak and change the settings for the next week. You can either say it was way to easy, hard but ok or way to hard. I choose way to easy because of all the extra exercises I did. 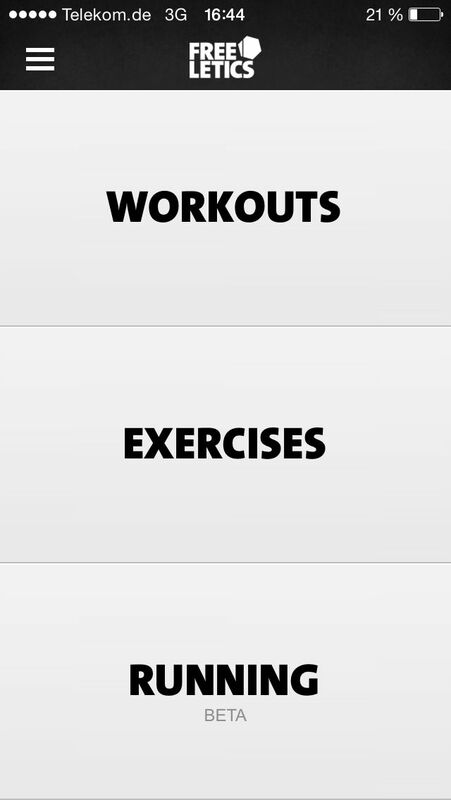 Other settings you can make are the volume settings (how many workouts per week) and the muscular limitation, in case you hurt yourself or just want to train a special part of your body.In general the new update brought some major changes to the Freeletics Experience. Apart from the warmup and stretching routines I wrote about in the previous post there are the following new features. Exercises are the elemental parts of the workout, like Burpees, Pushups or Situps. In total there are now around 39 Exercices available (excluding running). Some are new at all, some are just the former modified version of known workouts that have now a name. For example “Pikes” was the former modified version of Handstand Pushups. Exercises are clustered in Endurance, Standard and Strength exercises witch you can choose depending on your training fokus. There are no more MAX workouts, instead you can choose how many reptitions of an exercise you want to do in a range from 10 -2000 or for distance based exercises like frogs the max distance with a range from 1 x 10m to 2 x 1km. Running is a complete new feature in beta version that introduces a nike+ like user interface. You can choose a distance and see the route you are running an a map. A really good feature is the “turning point” where the App tells you when you reached half of your distance and it is a good time to turn. 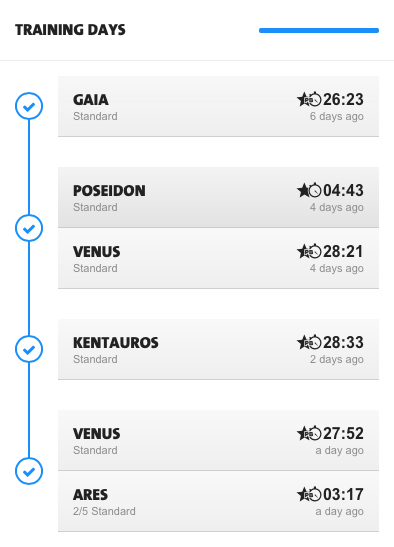 This feature anyhow is not included into the workouts, so if you do an Iris, where there is a 1km run at the beginning and the end, there will be no map and no distance measuring, but maybe this is comming later. Every Workout is now available in three different manifestations (like exercises) Endurance, Standard and Strength and in different intensity. Different intensities are only available with the coach I gues, they can not be choosen from the Workouts section. Here you can see the differences between endurance, standard and strength version of a workout.